Things I liked: Dual tank, slightly less fps than single tank but does 4-5 closely spaced fps shots without resorting to using mil-dots to compensate for droop. First 5 shots use about 250 psi each and my POI seems to remain the same. I use a hand pump which is good for occasional shooting but I was wishing I had a scuba tank while sighting in the rifle! Finish of gun is good, bluing and stock are very nice. Gun is well balanced, lightweight, and is easy to hold and aim. It’s loud but not excessively loud, a cross between a black powder rifle and a .410 shotgun. I found the recoil to be light. Cocking effort was high initially but rapidly fell off. I lubed it with light oil and now it’s very smooth. Accuracy is good and improving. When I first got the gun, at 50 yards I was holding 4” center-to-center groupings. After working on the trigger, I’m down below 2.5” and can get shots within ¾” of my POI. All of my shots have been standing while using a tree to steady the rifle and I seat the bullets before firing each time. At 50 yards, 200 grain round nose bullets go 1 ½” into loosely held phone books, but the damage extends another ½” beyond and the channel is over 2” across (this is supposed to simulate shooting into bone). I’ve not shot many 225 grain HPs but they seem to have similar groupings as the 200s. I used a 3-9x32 Bug Buster and UTG mount from my RWS 34 and reversed the rail to give about ½” more eye relief. The UTG mount should let me use a 4-16x40 Leapers scope and clear the rear sight. Things I would have changed: Polish and lube the trigger and sear at the factory. Lighter bullets to use against smaller animals. What others should know: I hated the trigger when I first got the gun, it had high resistance, effort was high, and the travel was excessively long, you just pulled forever before it would fire. It took about fifteen minutes of polishing the trigger and sear, and lubing everything to get rid of this. It will never be a match trigger but now it’s smooth, I know when it will fire every time, and I keep the gun on target as I pull on the trigger. Use emery cloth and DO NOT alter your sear or trigger or you gun could become unsafe! What others should know: Its hard to rate this gun. I loved it for a week than the top air compartment leaked after owning the gun and shooting less than 50 rounds. I disappointed that the warranty department told me 2-3 weeks to fix it, I am getting ready to ask for a refund. Things I liked: This rifle is awesome. Looks great , feels great , shoots great. Very Happy. Things I would have changed: lower rail system, under tank, little better front sight, something you can see better when the sun starts to go down. maybe a little better trigger pull. Trust me none of these things i bring up hurt the rifle use in anyway . Things I liked: I seen this on American Air gunner and said I God I got to come up with one of these. A Month later I had one delivered to my hose. I have done some hunting with t and it works quite well. It can also make your nieghbors think you are plinking with deer slugs. Its not a Texan though for 50 yards or so this is a powerfull gun I can get 14-15 high powered shots with 200 Bars in the cylinder. Things I would have changed: This thing is loud without ear protectoin you will harm your ears doing target practice. the iron sights shoot low out of the box. I got a small scope. What others should know: you need a good air a source or a Handhill MK4, the pum takes me about 45 mins. when I shoot with friends they sometimes top off my air for the road. Things I liked: This is called the best of ,nothing equals its compact results in it`s field a world beater-she is out front -a must have.I showed it to the turkey guys and they loved it.And (not to belittle its usefullness) this is a pretty baby! Things I liked: Love this air rifle. In fact I love it so much this is my second one since the first was taken in a home robbery. The rifle itself is well made and just a beauty to look at. The fit is excellent and detailed. Right out of the box it shot nearly dead on with the open sights. It maintained its power level better then the reviews suggested it with. I've put every type of air venturi pellet thru it they make. I like the hollow point but for general damage and destruction nothing beats the round ball. Alot of friends have shot it. Its been a eye opener for several retired sheriffs deputies locally as well as a couple hunters. It far exceeded their expectations and preconceptions. What others should know: This IS NOT a toy... this rifle will take down anything you shoot it at. Period. Deer, Hog, Coyote are not outside its scope. 2 inch oak boards crack in half at 40 yards from a strike with the round ball. Invest in a good pump, your going to be using it, it does take a bit of muscle to get it pumped to 200 bar. the air tank is great if your going to be shooting at the range, but not really practicle to carry with you else where. I got the 50 cal for gift. I love the power,but the hand pump is a joke I used it once and its crapped out. I bought the tank with the fitting and that works great. Things I would have changed: The rear sight permanent attachment point prevents the use of scope covers when using the the recommended Mantis 4-12x40 AO Rifle Scope. Either recommend scope rings that will provide better clearance or design the rear sight mount to allow it. There needs to be better information on the max range using the pellets, the air bolts are easy to determine the max deadly range. Things I liked: The rifle overall is a work of art. Love the accuracy and the extreme power that you can rely on. Great for hunting and some serious plinking, but defiantly not back yard friendly. Things I would have changed: Would love to see this rifle in a semi-auto. Plus it would be nice to be able to add a sling. But overall a really good one for the collection. What others should know: This is definitely not a toy and should be treated with the utmost respect. Things I liked: Robust build and reliable. Things I would have changed: More power and better trigger. What others should know: After a Saddle Mountain tune this gun shoots the AIR BOLT at 600 FPS and 193 gr. balls at 840 FPS. Where ya getting your round balls from? Things I liked: This is a great gun for the money! I hope to go hunting for small game soon. Things I would have changed: More energy! What others should know: Shoots the same ammo as my muzzleloader. Things I liked: It looks very sharp it is easy to fill and shoot. My 10 and 12 year old children have a blast shooting this rifle.So far I am very pleased with this purchase. Things I would have changed: I would like to see a longer fore arm and the front site could be of a better design. On the sights a day glow or some type of high vis would be nice. What others should know: This rifle is fun to shoot it is a little pricey as is the ammo. Other than that well worth the money for me. Things I liked: Let me sum up this gun in one word, POWER. Everyone who handles, uses air guns should do so with care. Especially if you're handling this gun. 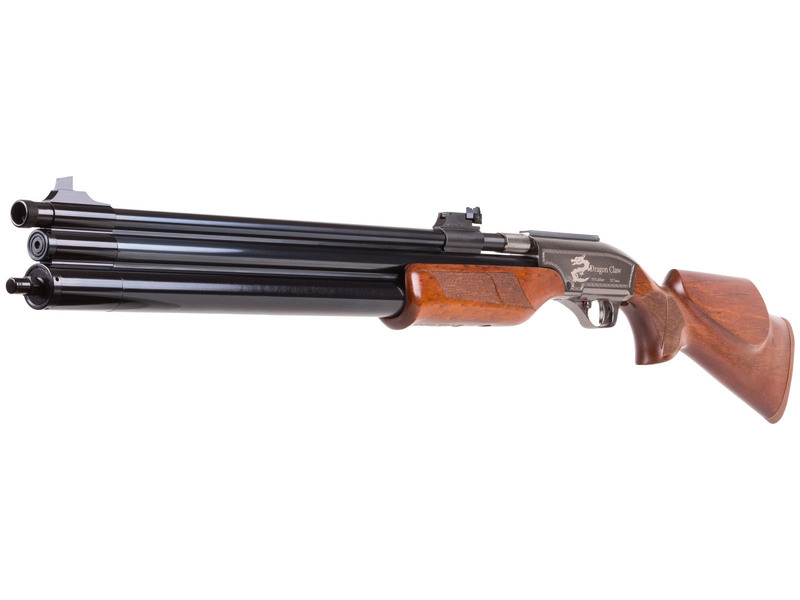 Sam Yang have created a true hunting airgun, ripe with power and energy. It has a beautiful wooden stock, and a midnight blue barrel. I have personally taken down 168 pound whitetail deer at 60 yards with this. It was a buck, I used 200 grain steel tip bullets, ran 25 yards and dropped, heart shot. If you're primary concern is hunting this thing will do a good job. I would not recommend hunting or trying to hunt any larger game than 250 pounds, why because it would be less humane for anything bigger, albeit within the right set of parameters like distance, shot placement etc it would be fine. But any hunter will tell you, you don't always get the favorable ideal shots most of the time. The other reason is well you might just end up injuring the animal and not really delivering a fatal blow, good luck tracking it. Things I would have changed: I wish I could attach a bipod to this gun, haven't found any that are compatible. At first glance it is sorta funky looking, and should come with a sling considering it is 10 plus pounds. The barrel can get easily prone to rust, extra care and maintenance required. Since bullets need to be placed in the chamber and seated in, it's difficult to take out if you decide not to fire, which means you either discharge the bullet, wasting it, or take it back home loaded. It's not a repeater, single shot only. Don't shoulder the weapon for too long, or else you will feel fatigue, affecting accuracy. The thing is not backyard friendly, it is loud, but not loud enough to need ear protection. Things I liked: First I have say this PCP is awesome and great addition to my collection. But let me give you a history into PCP.Got into PCP after I told my self I wouldn't. My first buy was the Benjamin Discovery and out of the box it leaked what looks from the gauge port O rings, still leaking. Next I bought a Benjamin Marauder. 22 pistol, yep you guessed it, it leaked but was fixed after tighten the foster fill port. Feeling lucky I purchased a .177 Marauder and everything was great out of the box but I wanted a .22 cal Marauder. This was a disaster of a buy, the gauge medal readout came loose and this one leaked air. After removing the plastic lens and repositioning the metal read out and giving the presure gauge a little twist I have it up to par. Feeling lucky I purchase and received my Sam Yang Dragon Claw today. After a few asembley things I tried to pressures the gun, no go so out come the Dawn. Bubbles coming from the Foster fitting, it was a little more then finger tight. It may be the black cloud I live under or I'm just unlucky. PS The first two was ordered from Amazon, the others where received from Pymaridair. Things I would have changed: Better assembly from the manufacturer and testing before it's leaves their factory. I can't be the only person receiving these type of problems at the prices of the product. What others should know: If you want a hard hitting PCP the Sam Yang Dragon Claw needs your consideration. Do you think this will be able to take out a wild boar here in Hawaii if shot in the brains? I would like to use this instead of a real gun to hunt a wild boar. I would like to set some snairs to catch wild boars then shoot them with is when they get caught in my traps. I think the Fosters fittings are being installed at PA, I'm not sure, mine came with the old probe fill. I recently bought Sam Yang 909 45 caliber light hunter from pyramyd air it;s a beautiful big powerful accurate rifle i do recommend this rifle to anyone looking for a big bore pcp rifle not only because it's a great quality build but because the power and the accuracy i'm so happy with Sam Yang 909 also you get better prices in amazon about the ammunition free shipping which is excellent many variety of pellets. really? no such thing as a legit bad review huh? Things I liked: Massive and good quality and can accept larger .50 cal grains. What others should know: No place to add a bipod and the scope rail you have to get another adapter that will accept a Picanny rail mounted scope. there is a bolt under the forearm that unscrews and a "bolt-pattern style" can be added for a bipod and or a short picanny rail cand be bolted and add the bipod to that.